Embedded with a Rose Quartz crystal, this 100% natural soy wax candle is infused with carefully blended essential oils to enhance its loving energy. 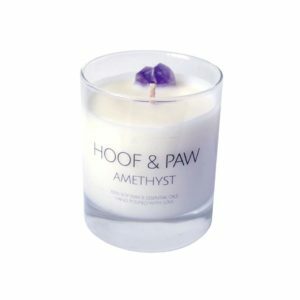 When lit, a subtle sumptuous blend of Sandalwood, Ylang Ylang and Black Pepper fill the room, emitting its loving energy. The stone of universal love, its energy promotes love, self-love, friendship, motherlove and kindness. When your candle comes to an end your crystal doesn’t. It’s energy will continue so keep it safe! 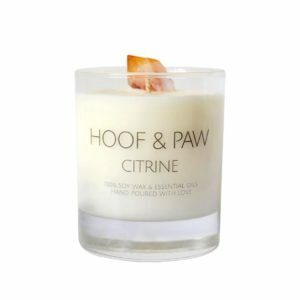 Sold by HOOF & PAW. Sold with lid and box. Travel Size (9cl) burn time approx 20hrs. Medium (20cl) burn time approx 30hrs. Large (30cl) burn time approx 35hrs. 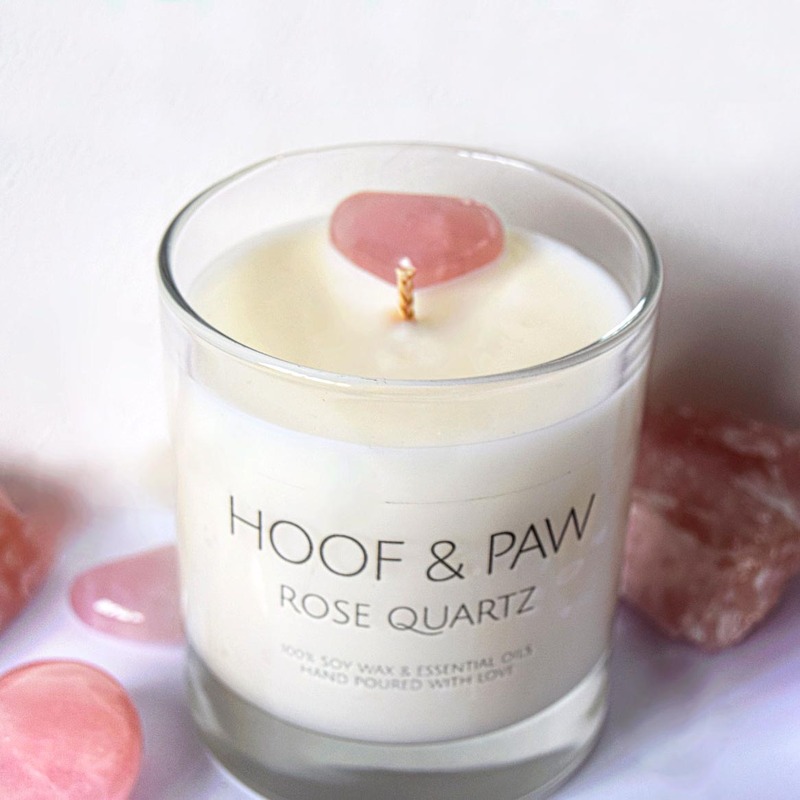 Rose Quartz is the stone of unconditional love and infinite peace, it is the most important crystal for the heart. It purifies and opens the heart at all levels and brings deep inner healing and self-love. 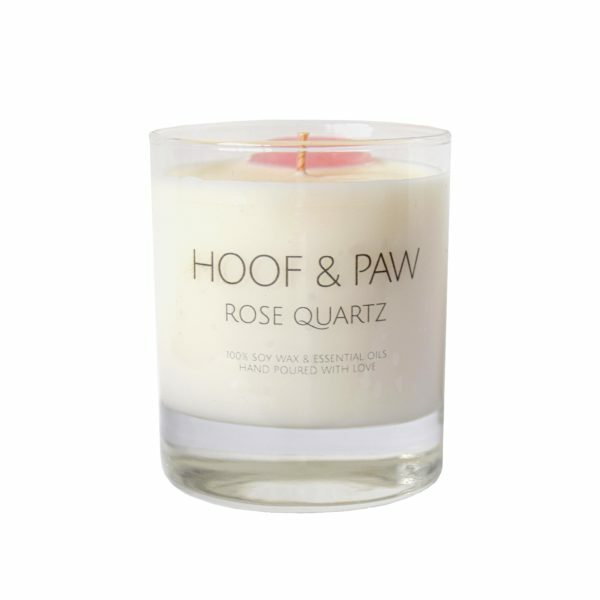 When lit, a subtle sumptuous blend of Sandalwood, Ylang Ylang and Black Pepper fill the room, emitting its loving energy. 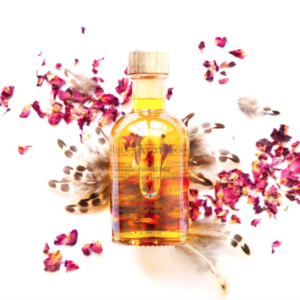 Sandalwood is a serene, calming and spiritual oil with a rich woody aroma. It improves focus, calms the nerves, as well as creating a romantic ambience. Ylang Ylang carries a sweet, floral aroma and is known for balancing both the body and the mind. Black Pepper is a warming and penetrating oil with a woody spicy aroma, it stimulates and encourages alertness and stamina. 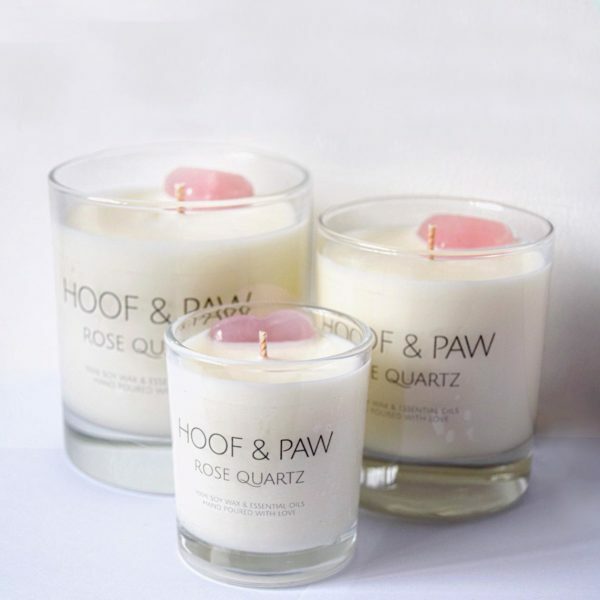 Only natural ingredients are used in HOOF & PAW candles. No paraffins or toxins are used, just 100% eco soy wax and essential oils, which have a positive, therapeutic effect on our wellbeing. No synthetic or lab created crystals are used, only natural crystals which capture their extraordinary energy and in turn enhance your wellbeing. 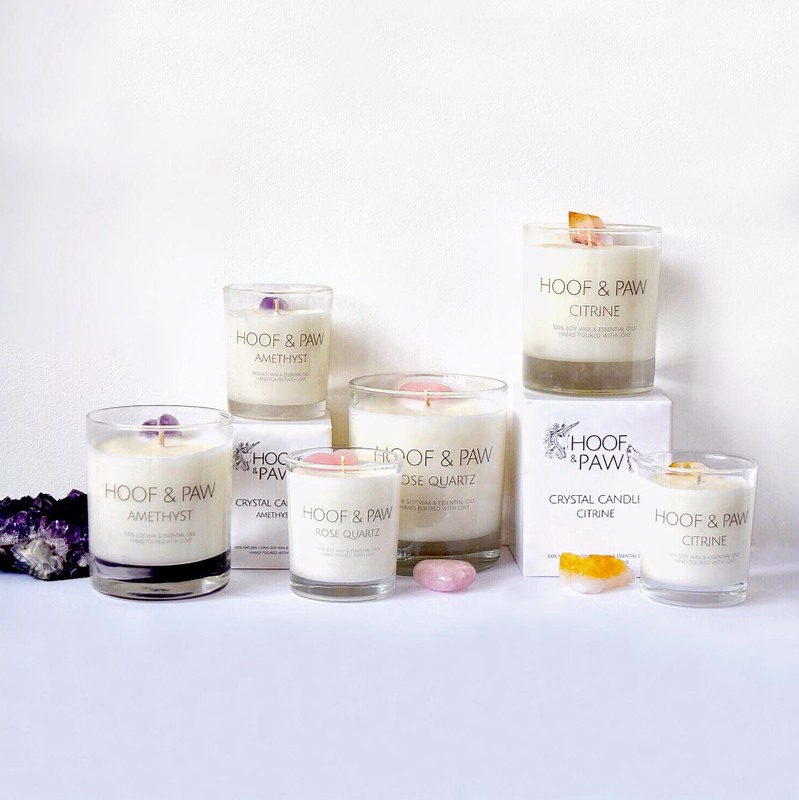 Through a love of all things magical, HOOF & PAW creator Madeline has always believed in the power of energy. She dreamed of creating a completely natural product that not only captures positive energy, but releases it into our spaces. HOOF & PAW’s crystals have been carefully hand selected and paired with essential oils to harness and enhance the magic in your life. UK first class deliver with Royal Mail: £3.50. Orders over £15 set at £4.50. If you wish to return or exchange your item please let us know within 7 days of receipt of item by emailing [email protected] Returns are accepted provided that the candle hasn’t been lit and remains in it’s original packaging. Bespoke candles are not refundable and shipping costs are at customers expense.